No. Now that several of the previously injured V-Reds are back, someone has to sit out, and Lynes is one of them. i guess that really just show's what a high calliber team the v-reds have, because in my opinion Lynes is a top 6 forward on most CIS teams. Personally I'd like UNB to try Lynes on the power play. 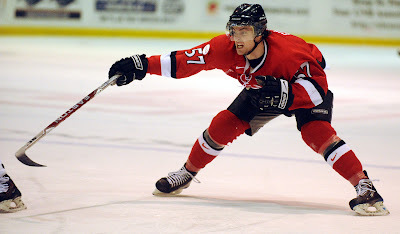 He's got a good shot, he's a offence-first player, and the UNB power play hasn't been very good for a while yet. Theirs no question Lynes strength is the Power Play. But after that it ends, he can't skate well, hes not fast at all, he doesn't win battles with the puck on the boards, hes not physical, and he doesn't carry the puck well. 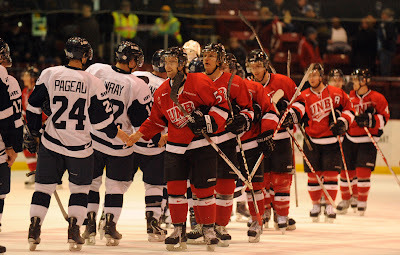 This is why he is not playing, hes simply the weakest forward on a deep UNB Team up front. His shot from the faceoff circles on the PP is definately his Strength. But who would you sit out to get Lynes in the Lineup? Nick Layton will likely be the other guy riding the Pines. Someone like Fillier while not as skilled, is just too physical and aggresive of a player to take off the 4th line, Lynes isn't a checking role player, and you certainly have too many guys that deserve to be on the top 6 forwards to include Lynes as a realistic person to be one of them.